We have already discussed all the main configurations of transformer vector groups. In the table of groups we also included transformer zig-zag connections. Now I will show you how that is achieved. The transformer primary or secondary can be connected in zig-zag . Zig-zag connection is sometimes desired as the disadvantages in star and delta connection can be overcome by the use of zig-zag connection of transformer. Here we discuss only the techniques of achieving some connection. Transformer connection is a good place for confusion. Applying these few points that we adopted will help understand the connections better. · Coloring is done to boost the visualization. 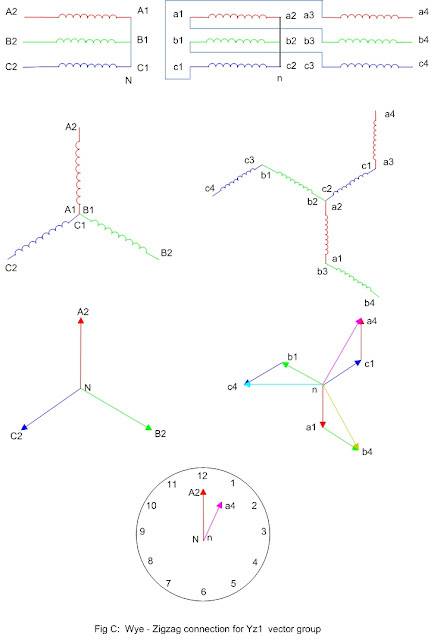 · Windings of same color are on the same limb of core. For example all the three red color windings are on one limb of core. · The voltage developed across the windings of same color are in phase (zero phase displacement) so they are drawn parallel to each other. · The analysis is done here considering anti-clockwise ABC phase sequence. · In any limb of core, windings terminals marked with even subscript are of one polarity and odd subscript are of other polarity. So for windings A1A2, a1a2 and a3a4, the terminals A1, a1 and a3 are of one polarity and A2, a2 and a4 are of other polarity. In zig zag transformer connection, there are three windings on each of the three limbs of the core, one for primary and two for secondary. Both the windings of secondary are of equal turns. The windings A1A2, a1a2 and a3a4 are wound on the same limb of the core hence they are all colored ‘red’. Similarly the other windings. Although looking at the diagram and applying IEC coding, you can easily verify the Dz0 connection, still you might find it difficult to draw. How can we obtain Dz0 connection? 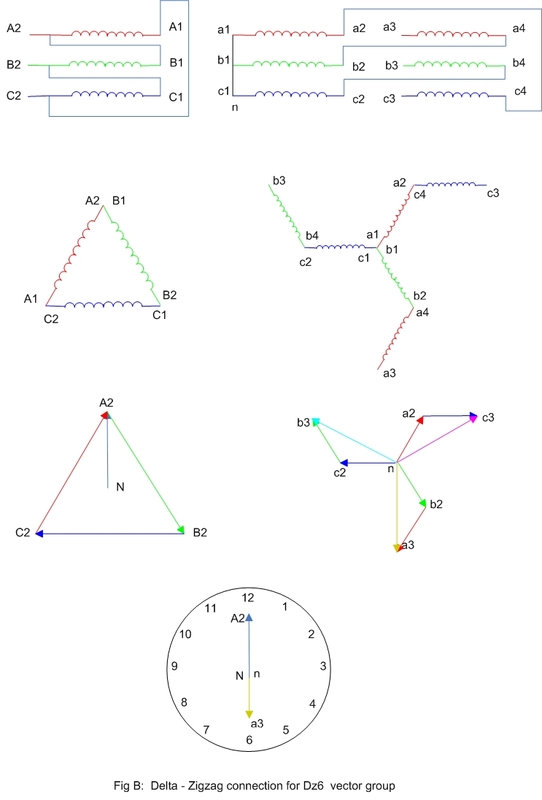 The easy way is first draw the phasor diagram and then derive the windings connection required for getting the desired phasor diagram or vector group. First question is what we need? Here for Dz0, the phase difference between primary and secondary is 0 degree. We have to connect the windings in such a way so that it will give zero degree phase displacement between the primary and secondary (or say the primary and secondary are in phase). See the diagram how connections are done to achieve a zigzag connection in the secondary. In the primary side A2, B2 and C2 are the terminals brought out at the transformer bushings. In the secondary side a4, b4 and c4 are the terminals brought out at the transformer bushings. Other terminals are internally connected. Actually for realizing the connection in secondary side the following sequence will help you. · Connect the primary side in Delta as usual or as we did in last article. · Then draw Delta(primary) side phasors. · NA2 phasor corresponds to a phase voltage in primary side. N is the virtual neutral, which does not exist physically in delta side, but found geometrically from the diagram. For obtaining the Dz0 configuration, the secondary ‘z’ side phasor diagram should be such so that the corresponding phase voltage (na4 here) phasor should be parallel to NA2. This zero phase displacement can be obtained by connecting the windings a3a4 with b2b1 (in other limb) in series. Clearly b1 should be connected to a3 and not the other ways. 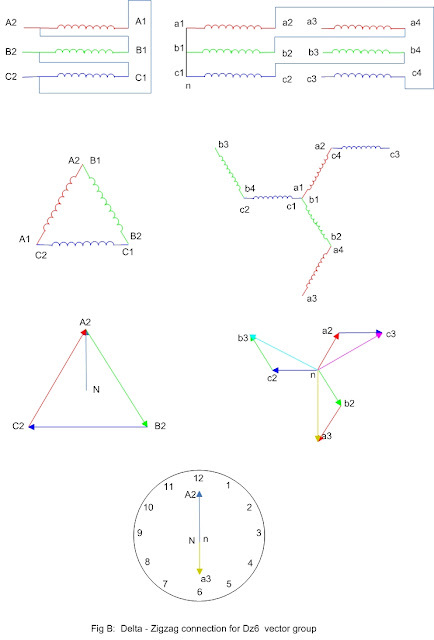 · The resultant phasor is the sum of the two phasors. Voltage phasors b2b1 and B1B2 are out of phase (180 degree phase difference), so the arrow head direction. Above addition is the phasor addition and not the arithmetic one. · Similarly obtain the resultant phasors for other two phases by recognizing the symmetry. This way we get the secondary neutral point 'n' by connecting a2, b2 and c2 together. Of course unlike the primary side neutral 'N', here the secondary side neutral 'n' is real and brought out at the bushing. So in this way we can realize the connection of windings from the phasor diagram. Accordingly the windings are connected. 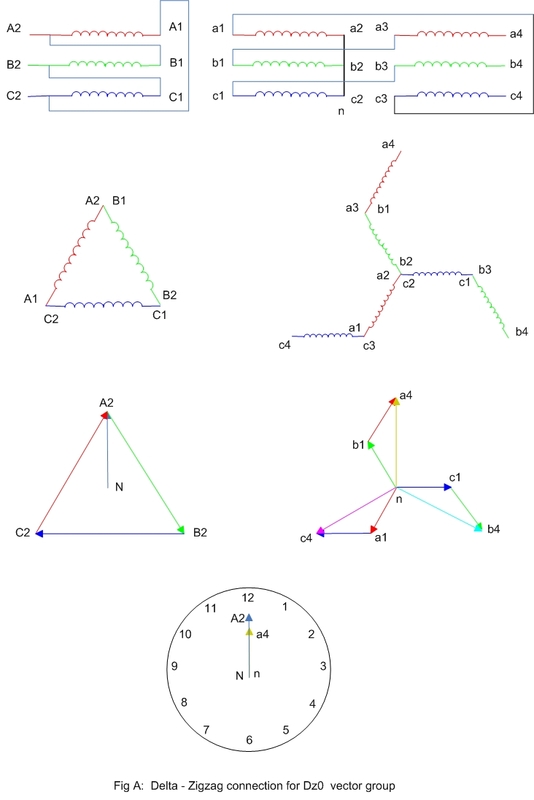 It is important that we realised the connection from the phasor diagram and rearranged the windings in Delta and Zigzag shape for better view. Here the primary side connection is same as previous case. In the secondary side we have just reversed the direction of phasors in previous case and automatically get Dz6 vector group. Of course now the phasors are rearranged to obey the rules of phasor addition. For phase 'a', na3=b1b2+a4a3. Compare it with previous Dz0 case. 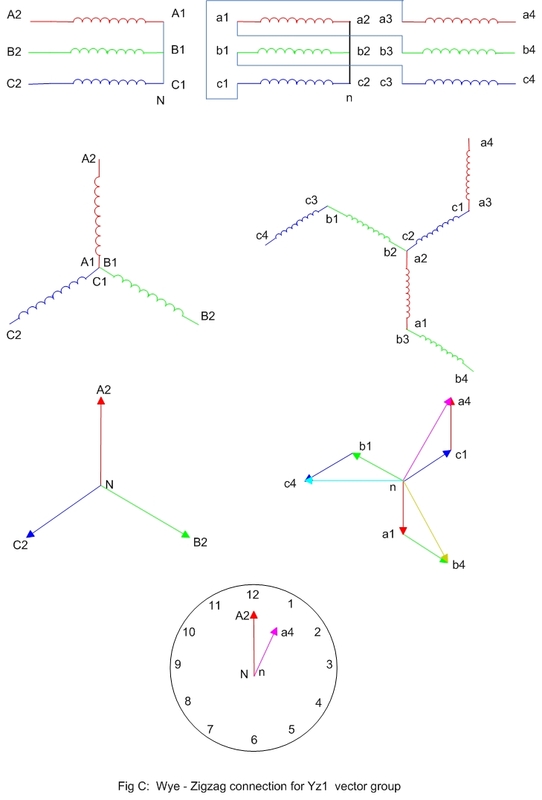 Below (fig-C) is the connection and phasor diagram of Yz1 notation. It is left for the reader to verify the vector group. 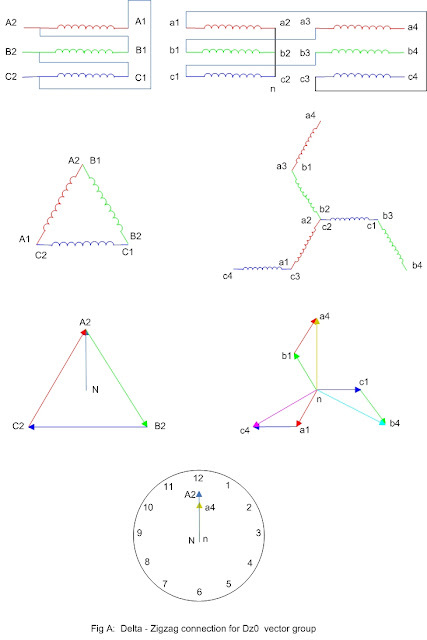 The reader should also practice the connections for other vector groups and corresponding phasor diagrams. I failed my course copying this! Then u learnt ur lesson.try not to copy anything from now on and use ur brain. BTW this article was a great help.really helped me understand a lot of things abt 3 phase connections.ty! Is Connection Dz1 or Dz11 possible? What connects to terminals a4, b4, and c4? If the secondary coils are wound in opposite directions the magnetic fields should cancel each other resulting in zero volts. If these terminals connect to the load wouldn't the voltage supplied to the load be zero?